Ted Cruz and Marco Rubio both got immigration facts wrong. 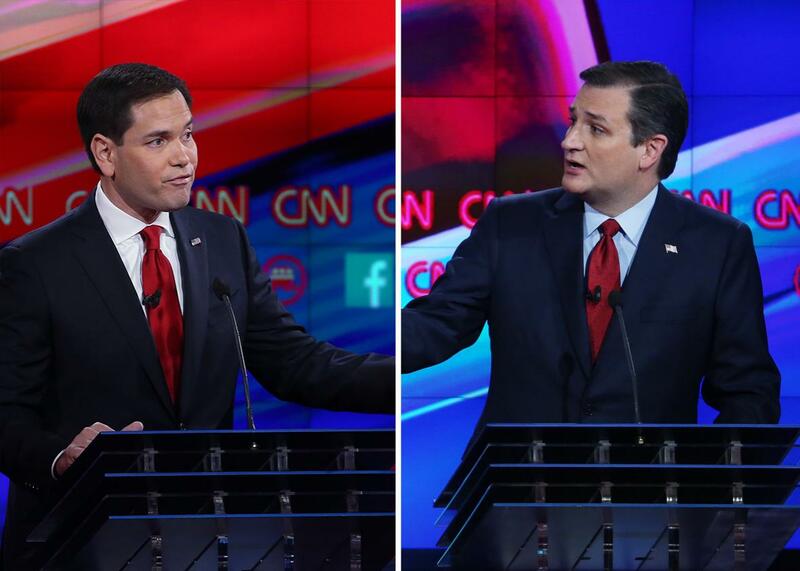 Rubio and Cruz Accused Each Other of Being Soft on Immigration Tuesday Night. They’re Both Wrong. Rubio and Cruz. Wrong and wrong. During Tuesday night’s GOP debate, one exchange became particularly heated: Ted Cruz and Marco Rubio’s debate on immigration. Rubio accused Cruz of being soft on immigration, and then Cruz accused Rubio of the same. They both can’t be right. So which one is? The answer is neither, as you might expect from presidential debates. Rubio is wrong on all three points. First, Cruz does not support legalization for undocumented immigrants, and never has. In fact, conservative Hispanic leaders met with Cruz’s campaign chairman on Monday to raise precisely this point with him. They were concerned that he was “perhaps worse” than Trump on immigration after Cruz’s campaign expressed to them that he believes in “attrition through enforcement”—the idea that if life is miserable enough for immigrants, this will act as a deterrent to other potential immigrants, thus solving the immigration crisis in one easy, inhumane step. This is also known as Mitt Romney’s “self-deportation” immigration position that cost him the Latino vote in 2012, and thus, many argue, the presidency. On visas and green cards, Rubio is also wrong. Cruz did once support increasing the yearly quota for H-1B visas, but last month walked that proposal back, saying his administration would put a freeze on these visas for six months while it conducts an investigation on allegations of abuse. Cruz adamantly denied all of Rubio’s claims, and rightly so—he’s second only to Trump of the immigration hard-liners. But he then went on to spin his own set of misrepresentations, saying he led the fight against “Rubio’s legalization and amnesty bill,” referring to the Gang of 8 bill, a bipartisan bill sponsored by Sens. Lindsey Graham, John McCain, and Rubio, among others. Cruz did lead the fight against the bill, but the Gang of 8 bill wasn’t an amnesty bill. It did, ironically, propose to do many of the things Rubio accuses Cruz of wanting to do: It would have provided a path to citizenship that included a fast track for college students in STEM fields, increasing the number of green cards available to them, and opening a separate channel for legalization for agricultural workers, among other provisions. Cruz said his own immigration plan focuses on “stopping the Obama administration’s policy of releasing criminal illegal aliens.” But the Obama administration has in fact made it a point to target undocumented immigrants with criminal backgrounds for removal more than any other past president. Cruz and Rubio are the only two Latino candidates on both sides of the race. They are both of Cuban immigrant parents. And neither of them have strayed far from the Republican Party’s hard line against immigration, a fact Latino groups have duly taken note of, calling them “traitors” and “sellouts.” But the truth is that even though Cruz’s claims about Rubio were wrong, and even though Latino groups are angry at them both, Rubio is slightly softer—or as I like to call it, slightly more humane—on immigration. Offering some kind of path to citizenship, however narrow, is something Rubio should be proud of, not trying to hide.